Canadian Prime Minister Justin Trudeau said in an interview published on Aug. 31. that President Donald Trump is an authentic person. Trudeau, 45, was asked in an interview with American media company The Skimm what had surprised him in his interactions with Trump. “The person he is on camera in public, is very true to the person he is in private,” Trudeau said after describing him as an authentic person. 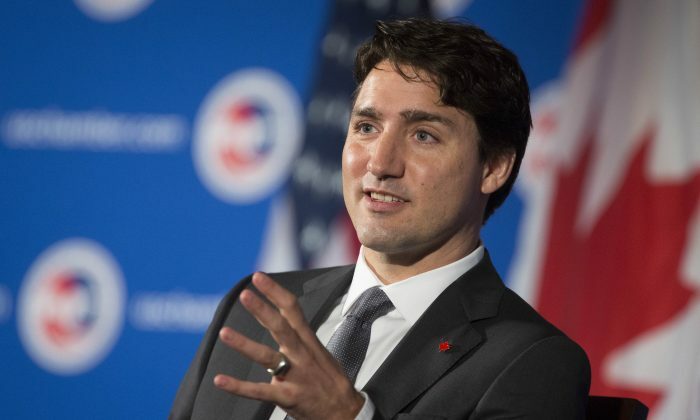 Earlier this year Trudeau made similar comments when he said Trump is not a typical politician, in that he is willing to change his mind when presented with good arguments. “As politicians, we are very, very much trained to say something and stick with it, whereas he has shown that if he says one thing and then actually hears good counter-arguments or reasons why he should shift his position he will take a different position if it’s a better one, if the arguments win him over,” Trudeau told Bloomberg in April. “I expect him to be standing up for what’s in the best interest of his citizens, and I’m going to work hard to stand up for what what is in the best interest of my citizens,” he said. In January, just four days after assuming office, President Trump signed a presidential memorandum reviving the construction of the Keystone XL pipeline, which had been halted under the Obama administration. Canada has been a fierce proponent of the pipeline which is expected transport up to 870,000 barrels of crude oil from Alberta’s oil sands to the United States, creating thousands new jobs and tens of billions of dollars in economic activity. There have also been some tensions between Canada and the United States this year. A longstanding trade dispute between the two neighbors led to Washington imposing duties on Canadian softwood timber after accusing Canada of selling it below market value in the United States. In response, Canada said it would consider banning American thermal-coal imports. Canada, Mexico, and the United States are currently in the process of renegotiating the North American Free Trade Agreement (NAFTA). NAFTA was passed in 1993 and came into effect on Jan. 1, 1994. While the trade deal was promised to create hundreds of thousands of new jobs for Americans, critics say that NAFTA led to many companies relocating to Mexico or having to compete with Mexican firms on U.S. soil, leading to job losses and wage stagnation in America. When President Bill Clinton passed NAFTA, he said that a key element was for the government to help re-school American workers. “We have to tell American workers who will be dislocated because of this agreement, or because of things that will happen regardless of this agreement, that we are going to have a reemployment program for training in America. And we intend to do that,” Clinton said at the time. Critics say that part of the problem is that this never happened effectively. In 2016, the United States had a trade imbalance of over $64 billion with Mexico, and $11 billion with Canada. President Trump has frequently criticized the trade deal saying he will terminate it if renegotiations fail. “I personally don’t think you can make a [new] deal without a termination, but we’re going to see what happens,” Trump said at a rally in Phoenix on Aug. 23.